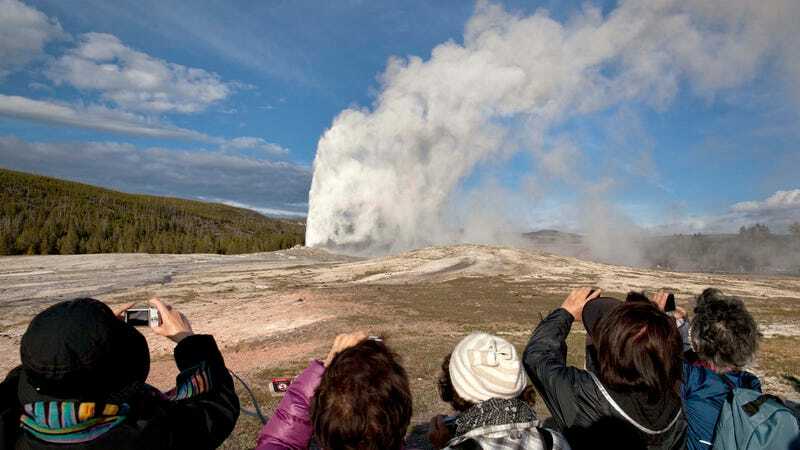 Do not lose sleep tonight, the world will not end as the result of some enormous supervolcano eruption in Yellowstone National Park any time soon. But there is a whole lot of other interesting stuff going on there—so maybe it’s worth losing sleep by getting excited about science. Nerd. A swarm of earthquakes rumbling since June has begun to die down, according to an update from the Yellowstone Volcano Observatory. Newsweek reports that this has been the longest swarm on record, with almost 2,500 earthquakes hitting the park since June 12. But despite the recent though seemingly eternal hype surrounding the supervolcano and its supposed apocalypse-causing potential, this is just business as usual. A “swarm” doesn’t look violent, but rather like a lot of rumbling over the course of many days. September saw 78 quakes, August saw 894, July saw 475 and June 1028. The largest in September only had a teeny magnitude of 2.3. The largest of the swarm’s quakes’ magnitudes was 4.4. The swarm seems to have died down by now—and it left behind some data that scientists can now study. “We’ll look at the patterns of earthquakes and see if they illuminate any subsurface faults we don’t know about, and look at the type of earthquakes to see if they can tell us what’s going on,” said Farrell. Okay, but when should you (and how much should you) worry about some sort of apocalyptic eruption? Farrell pointed out that the widely-cited figure, that the volcano erupts catastrophically every 600,000 years, is a myth based on only three prior eruptions. This figure is sort of like saying your father and grandfather and uncle all died at 60, so surely you will die at 60 as well. There isn’t nearly enough data to say when it will erupt like that again, or even if it will. On top of that, the volcano does experience smaller eruptions more frequently that wouldn’t cause the same mythical destruction. The last one was 70,000 years ago, according to the USGS. And if you’re still worried, scientists do have a monitoring system in place so they know if and when something will happen. They watched for increased seismicity, changes in the pools of hot water in the area, more gas, and the ground changing shape all happening at the same time.